YoYoExpert Blog & Yo-Yo News – New C3 Bi-Metal! The ATOMIC CRASH! 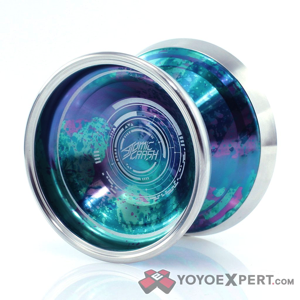 Over the years C3yoyodesign has added to their popular 「Crash」 series. From alpha to gamma to mega and now they are proud to present the unstoppable new ATOMIC Crash! Following the successful release of the hybrid Gamma Crash in 2017 and the instant hit of the oversized Mega Crash, the all new Atomic Crash is a no nonsense competition geared bimetal model. Machined from 6061 aluminum, fitted with steel rings and a titanium axle. The all new design creates the ultimate weight distribution that allows increased stability and control beyond belief, as well as improving the already incredibly fast nature of the Gamma Crash and allowing for insanely smooth regens! If you want something lightweight with a seriously powerful spin then look no further than the Atormic Crash!